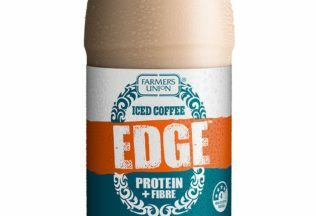 Iconic South Australian brand Farmers Union Iced Coffee has released its first true innovation in six years, the all-new Farmers Union Iced Coffee Edge liquid breakfast. A quick brekkie to go that’s made with real coffee, protein and fibre, the new product from Farmers Union Iced Coffee is available from Friday May 11. The new option is available in both Original and Mocha flavours throughout convenience, supermarkets and independents across SA, VIC and NT. Darryn Wallace, Marketing & Innovation Director at Lion Dairy & Drinks, said this long-awaited launch was motivated by the brand’s die-hard fans. “We know that one in three people are regularly tucking into brekkie on the go, but they still want their morning coffee kick,” he said. Still proudly manufactured in Salisbury, South Australia, Farmers Union Iced Coffee Edge will be hard to miss with a huge campaign launching across out of home, digital, radio, PR and sampling channels across South Australia to coincide with the launch. Pepsi Max Vanilla is now available in Australia. Collins Food has acquired 28 Australian KFC stores from Yum! Brands.